When you add type, paint with the Brush tool, or create a shape, you’re using the foreground color. On the background layer of an image, when you use the Eraser tool, or when you increase the size of your canvas, you’re accessing the background color. When you drag with the Gradient tool, so long as your gradient is set to the default, you’re laying down a blend of color from the foreground to the background. Elements gives you three ways to choose your foreground and background colors: the Color Picker; the color swatches; and the Eyedropper tool, which samples color in an image. By default, Elements uses a black foreground color and a white background color. If you want to go back to the default color, press the D key. If you want to swap between foreground and background colors, press the X key. If you want any other color of the rainbow, click your desired swatch to change either the foreground or background color. This action transports you to the Color Picker. Choose your desired color from the Color Picker. Click either the foreground or background color swatch on the Tools panel. Drag the color slider or click the color bar to get close to the general color you desire. Choose the exact color you want by clicking in the large square, or color field, on the left. The circle cursor targets your selected color. 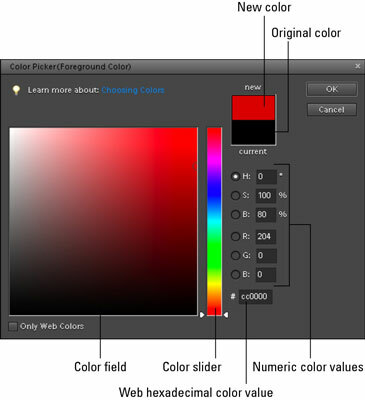 The two swatches in the upper-right corner of the dialog box represent your newly selected color and the original foreground or background color. When you’re happy with your color, click OK.
Another way Elements enables you to choose a foreground or background color is by selecting a color on the Color Swatches panel. In addition to preset colors, you can mix and store your own colors for use now and later. You can have palettes for certain types of projects or images. Choose Window→Color Swatches to bring up the panel. To grab a color from the Color Swatches panel, click the color swatch you want. It doesn’t matter which tool you have. As soon as you move the tool over the panel, it temporarily converts to an eyedropper that samples the color and makes it your new foreground or background color. Choose and store colors in the Color Swatches panel. Change the background color. Either first select the background swatch on the Tools panel or Ctrl-click (cmd-click on the Mac) a swatch. Use preset colors. 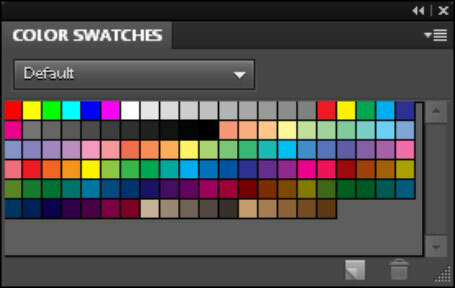 To load a particular preset swatch library, select it from the Color Swatches panel menu. Elements offers libraries specific to Web graphics, photo filters, and Windows and Mac OS systems. Add a color to the Color Swatches panel. Choose New Swatch from the panel menu. You can also simply click an empty portion of the panel. Name your swatch and click OK.
Save swatches. Choose Save Swatches from the panel menu in the upper-right corner of the panel. Save swatches for Exchange. Choose this command to save your swatches for use in another Adobe program. Name the swatch set, and save it in the same folder listed in the above bullet. Load swatches. If you want to load a custom library created by you or someone else, choose Load Swatches from the panel menu. In the dialog box, select your desired library from the Color Swatches folder. The new library is added to your current library. Delete swatches. To delete a swatch, drag it to the trash can at the bottom of the panel or Alt-click (Option-click on the Mac) the swatch. Change the panel’s appearance. Click the panel menu to choose from Small or Large Thumbnail (swatch squares) or Small or Large List (swatch squares with a name). Replace your current swatch library with a different library. Choose Replace Swatches from the panel menu. Choose a library from the Color Swatches folder. Another way that Elements enables you to choose color is via the Eyedropper tool. The Eyedropper tool comes in handy when you want to sample an existing color in an image and use it for another element. For example, you may want your text to be the same color as a green background. 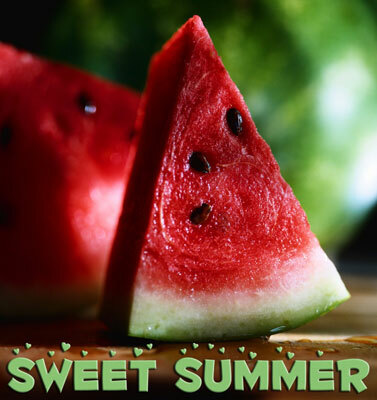 Grab the Eyedropper tool (or press I) and click a shade of green in the background. The tool samples the color and makes it your new foreground color. You can then create the type with your new foreground color. The Eyedropper tool enables you to sample color from your image to use with other elements, such as type. Sample a new foreground or background color. You can select either the foreground or background swatch on the Tools panel before you sample a color. If the foreground color swatch is active, holding down the Alt key (Option key on the Mac) samples a new background color, and vice versa. Choose a color from any open image. If you have multiple images open, you can sample a color from an image that you’re not working on. Choose your sample size on the Options bar. You can select the color of just the single pixel you click (Point Sample), or Elements can average the colors of the pixels in a 3-x-3- or 5-x-5-pixel area. Make colors Web safe. If you right-click your image, you have a hidden option: Copy Color as HTML. This option provides the Web hexadecimal color formula for that sampled color and copies it to the Clipboard. You can then paste that formula into an HTML file or grab the Type tool and choose Edit→Paste to view the formula in your image. Toggle between the Eyedropper and other tools. Elements enables you to temporarily access the Eyedropper tool when you’re using the Brush, Pencil, Color Replacement, Gradient, Paint Bucket, Cookie Cutter, or Shape tool. Press the Alt (Option on the Mac) key to access the Eyedropper. Release the Alt key to go back to your original tool.